Education research now makes it clear that of all the factors that schools can control, teacher quality is the most important for student achievement. Efforts to reform public education within the current system of publicly financed school districts must therefore include improvements to teacher quality. A research consensus has also emerged that a teacher's years of experience and advanced degrees do not generally enhance his or her ability to improve student achievement. Still, the current teacher pay system in conventional Michigan school districts — the "single-salary schedule" — rigidly determines a teacher's pay based solely on years of experience and work on postsecondary degrees. It is difficult for many educators, policymakers and community members to accept the need for fundamental changes to how Michigan compensates teachers. The mere mention of the words "merit pay" — the idea that teachers receive at least part of their compensation based on their students' performance on exams — often evokes a defensive response from many well-intentioned teachers and policymakers, who recoil when they perceive any implicit criticism of Michigan's teachers. This is ironic. Well-designed merit pay would, after all, reward Michigan's many fine teachers with additional income and a tangible sign of their employer's esteem. True, a good merit-pay system would also put real pressure on ineffective teachers to improve quickly, but this hardship should be weighed against the important benefits to Michigan's many good teachers, whose jobs are made harder when their peers perform poorly, and to Michigan's children, whose learning is harmed when teachers fall short. Ultimately, a sound merit-pay program would help good teachers, spur underperforming teachers and improve student achievement. 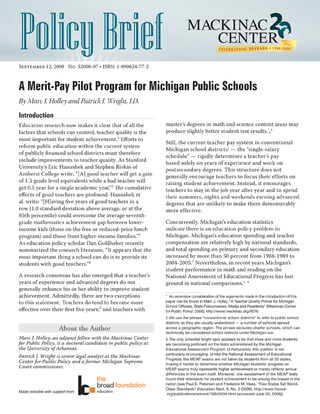 The current skepticism of Michigan's public education community toward merit-pay proposals suggests that a privately financed pilot program could be a helpful - even necessary - prelude to comprehensive changes in public school teacher compensation policy. The plan presented in this paper aims to reward teachers for elevating student achievement and to generate interest in re-examining current teacher compensation schedules. Why a bonus, rather than a new salary schedule?